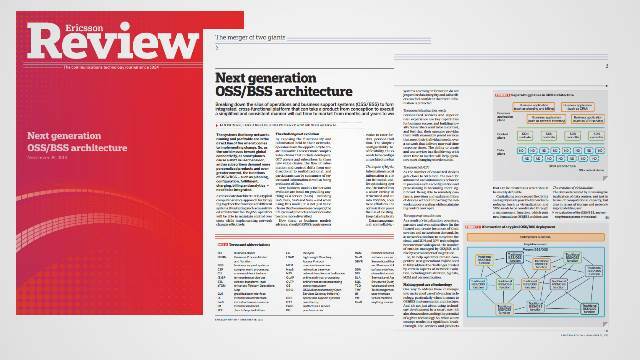 In November Ericsson published their vision for the next generation of OSS/BSS architectures. If you have even a passing interest in the technology behind OSS BSS, you should read it. I spent quite a bit of time when OSS Line started, waaaay back in 2008, talking about OSS architectures, integration and data models. If one thing has happened in the subsequent five years its that virtually nothing has changed in the major OSS vendors’ platform architectures since then. There’s been a bit of tweaking to introduce new technologies here and there, and I’m sure some new products have been designed with Cloud and virtualization in mind. But no major shift. Now, Ericsson has vision for a new architecture that addresses the needs of OSS/BSS this decade. But is it achievable? The answer, for much of it, is yes. Some features require more effort to implement than any OSS/BSS vendor has been willing to invest in the past. For example, Ericsson propose that the OSS/BSS data models be standardised for the business and moved on to a common platform along with a business process execution capability. This sounds a lot like the Enterprise Architecture Bus heavily promoted in the 90s and early 00s which didn’t happen, simply because standardising data and processes for multiple legacy applications in one place is virtually impossible. Is this more achievable now, or is there more motivation to implement it to realise the benefits? This is a ‘vision’ though or, more practically, a roadmap for how architectures should be designed going forward. I wouldn’t like to have to take existing OSS/BSS applications and re-factor them to work with a new hybrid SQL/NoSQL database platform. But if I am developing new applications now, yes, that’s the way to go. The paper goes on to discuss the implications of hypervisors, IaaS, and even SDN. Well worth a read if you’re at the geeky end of the OSS/BSS scale.